Dual Seal Dual Skin (DSDS) and double louver - Bachmann Dampjoint Inc.
Our DSDS design is the best technical and commercial fit for isolation applications where the damper is normally open, and reliability is a concern. 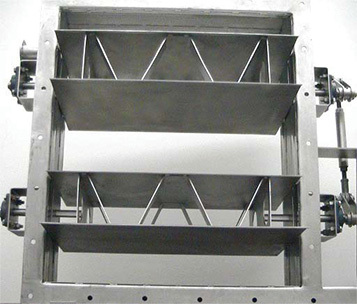 The innovative DSDS design is our cost-effective dual-louver solution that is transforming the isolation damper market, specifically in applications where the damper is normally open. It’s no surprise that we have more experience designing,manufacturing and assembling DSDS dampers than all of our competitors combined! A striking feature of our DSDS damper design is its single row of blades, each with a dual skin. This apparently benign innovation ensures dual seal contacts, and is transforming the isolation damper market because of its significant benefits. 100% isolation – Indeed, when seal air is used, our DSDS damper allows 100% isolation. If no seal air is used, 99.5% isolation can be achieved. Reduced capital cost – Our Dual Skin design requires fewer materials (half as many shafts and fewer linkages) and less labor (less welding). This is reflected in the very competitive price of our DSDS dampers. Low seal leakage – In our DSDS design, louver shafts do not cross any frame seals, which is the case in all competing dual louver designs. Consequently, seal contact and continuity is increased, leading to lower actual leakage amounts. Another key advantage is that no seal air is required when our DSDS damper is open. This feature makes our DSDS design ideal for normally open applications, such as for fan isolation inlets/outlets, as well as for FGD inlets/outlets. Mitigation of corrosion issues – Since the seal air system does not need to be continuously “on”, cold air will seldom flow within the damper (only when the damper is shut). Therefore, there is minimal cooling of the damper’s frame by exterior air. Cooling of damper parts can lead to corrosion problems when flue gas temperature gets close to the acid dew point. Our DSDS damper design completely eliminates this issue. Reduced cost of operation – Indeed, with no continuously running fans, operating costs are significantly lower when compared to guillotine dampers, for example, that require constant-running seal air. Moreover, our DSDS damper is entirely self-contained within the duct, with no cavities. Indeed, there is no protruding damper bonnet, as is the case with guillotine dampers and the frame is engineered not to have any cavities in its normally-open position. Reduction of structural and wind loads – With a self-contained unit, the damper’s center of mass is in the middle of the duct, which reduces wind-related stress loads. In addition, with no bonnet or seal cavity, the DSDS damper frame won’t flex as other damper designs will. No risk of acid condensation and dust accumulation – Our DSDS damper design has no cavity in its normally open position. Therefore, there is no risk of acid condensation and dust accumulation. Furthermore, the need for expensive bonnet insulation or heat tracing is completely eliminated. Finally, our DSDS dampers have been engineered to be easier to ship and field spliced. This adds to the significant cost advantages over competing designs. As you can see, our DSDS isolation damper design is the best technical and commercial solution for applications where the damper is normally open, and reliability is a concern.